Charles Brunson (1830-1916), born in Westphalia, Germany, migrated to America in 1845. About 1867 he settled in Columbus, establishing a saloon, which prospered. In 1891 he erected this building, adding adjacent store in 1896. 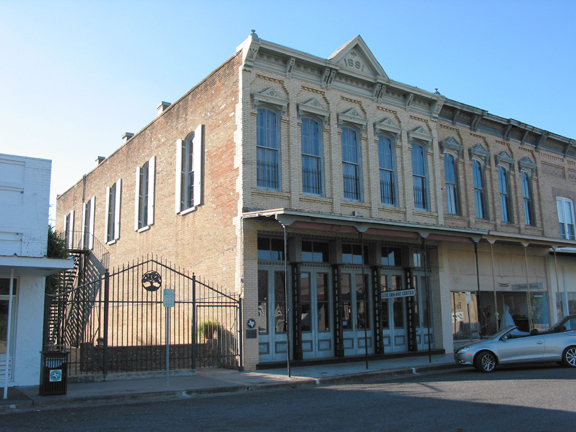 Used as saloon until about 1919, building later had other occupancies. Except for lowering of canopy and some changes in windows, it retains original Victorian style. Allen Wendel has owned this property since 1970. Ground was broken Tuesday for the large brick building of Messrs. Slutler & Brunson, Milam street. It will be 33x90 feet, 15 feet first floor, 14 feet second floor, iron front, and finished throughout. Mr. Hastings will look after the wood work and Mr. Joy will attend to the brick part. This will be a handsome, comfortable business house, and add much to the appearance of this part of town.